Jared Leto vividly remembers the day he went to Whole Foods during a break in shooting Dallas Buyers Club just to stare at the vittles. 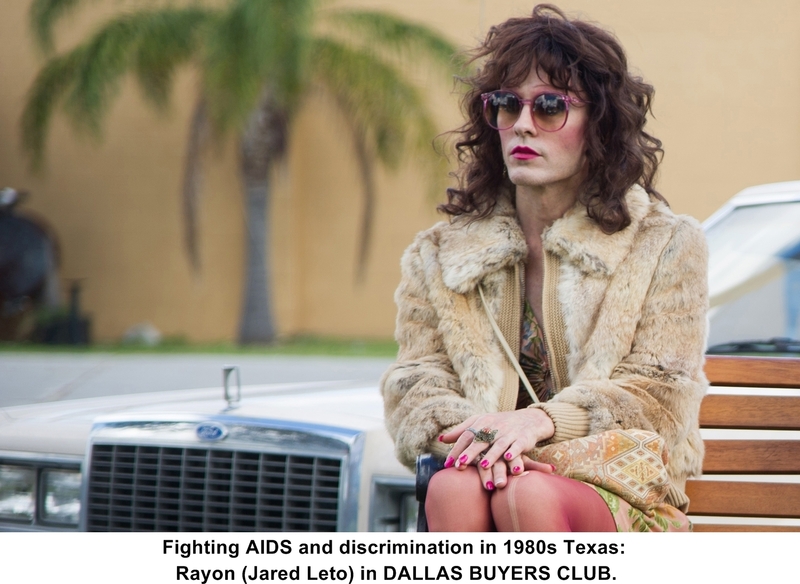 To play Rayon, an AIDS-afflicted transgender man living as a woman, the actor-musician lost 30-40 pounds for the role by simply not eating. He also never broke character for the duration of the shoot, so he essentially was Rayon while he communed with what he couldn’t partake. “I got three looks,” Leto recalls on a recent visit to the San Francisco Bay Area where he was feted at a screening of Dallas Buyers Club at the Mill Valley Film Festival and performed with his band 30 Seconds from Mars at a San Jose concert. Those nasty looks also meant that Leto was doing his job, convincing even when the cameras weren’t rolling as the character elicits similar disgust from Ron Woodroof (Matthew McConaughey) when they meet in a hospital AIDS ward in Jean-Marc Vallée’s drama. The homophobic electrician and rodeo cowboy has no use for the likes of Rayon, but when he feels firsthand the kind of rejection she has faced her whole life, it opens the door to an unexpected friendship as the two partner to try to save their own lives. Leto jokes that the only actor who works less than he does is Daniel Day-Lewis. Staying in character the way he does is draining. Since making 2009’s Mr. Nobody he had no real interest in going back in front of the cameras until he read Craig Borten and Melissa Wallack’s Dallas Buyers Club script. Vallée has said that he never met Leto until after Dallas Buyers Club wrapped. The actor confirms that that assertion is true as he talks about how he started to get into character from their first Skype phone call. He remembers putting on lipstick as Vallée was introducing himself, removing his jacket to reveal a pink sweater worn off the shoulder and flirting with the director. The next day he had the job. To better understand the role, Leto met with transgender people, studying their physicality and listening to their stories, learning from their experience. He only had a few weeks to become Rayon, so the extreme dieting started immediately. He also had to learn to walk in heels and endure body waxing. “Once you make those commitments and the eyebrows come off, you’re like, ‘OK, here we are,” he says. “Lipstick, heels, eyelashes were a lot of external keys to some of the physicality, but I think there was a gentle spirit and kindness that were really keys [to the character] as well, that desire to be loved and to love other people. “Staying in character was just an obvious thing for me,” he adds. “There were so many physical attributes, so many emotional things to keep track of. I couldn’t imagine letting go of all that and going, ‘Hey, bro, what’s going on?’ ‘Action!’ ‘Oh, wait, let me bring all of this back.’ I don’t think I would have done a very good job. Staying focused was essential. Dallas Buyers Club has garnered raves ever since its world premiere at the Toronto International Film Festival. Leto is pleased and surprised that his performance along with McConaughey’s is the subject of much buzz as the awards season commences. He is happier still that the work he, McConaughey, Vallée and everyone else involved in making the film put in paid off in the final cut.